NV-518A Dual Video/Audio Transceiver contains one amplified receiver that allows transmission of real-time monochrome or color video and audio over Unshielded Twisted-Pair (UTP) telephone wire. An additional passive port is included allowing the support of bi-directional video, or as a second receive path up to 750ft (225m). 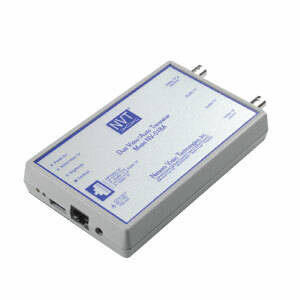 Alternately, the ports may be combined to allow the NV-518A to function as a repeater. Baseband (composite) signals of any type are supported. The unparalleled interference rejection and low emissions of the Model NV-518A allow video signals to co-exist in the same wire bundle as telephone, datacom, or low-voltage power circuits. This allows the use of a shared or existing cable plant. Video signals traveling in opposite directions in the same wire bundle are limited to 1,000ft (300m) over Category 2 or 3, and 2,000ft (600m) over Category 5 or better wire. The NV-518A comes with an RJ45 patch-cord and power supply.